Author(s): Ravi Kiran Chilivery, Sangilimuthu Alagar, Department of Biotechnology, Karpagam University, Coimbatore-641021, Tamil Nadu, India. Teepica P. Darsini. Background: The current study was performed to evaluate the anti-urolithiatic activity of Argemone mexicana L. leaves extracts as natural remedy to over come side effects problem due to the usage of modern synthetic medicine. 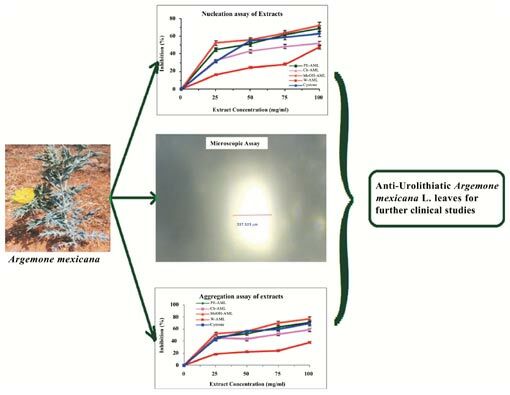 Methods: In vitro experiments (nucleation, aggregation and microscopic assay’s) were performed to test the anti-urolithiasis activity of A. mexicana extracted using the four different solvents i.e. petroleum ether, chloroform, methanol, and water. These extracts were tested at increasing concentration of 25, 50, 75 and 100 mg/ml and compared with the standard drug cystone. Result and Discussion: The extracts were tested for the inhibition percentage of anti-urolithiasis potential against preformed calcium oxalate crystal. The results of A. mexicana extracts on nucleation assay were found to be significant and the methanol leaf extract showed considerable inhibition (72.26%) compared to standard cystone drug (62.96%) and in aggregation assay also the methanol leaf extract of A. mexicana showed significant inhibition (77.24%) compared to cystone (69.33%) at 100 mg/ml concentration. The microscopic assay clearly indicated that A. mexicana leaves extracts are capable to dissolve the calcium oxalate crystals. Conclusion: The methanol extract of A. mexicana leaves contains anti-urolithiatic potentials by in vitro at a dose level of 100 mg/ml. The methanol extract of A. mexicana leaves can be further exploited as a potential anti-urolithiasis drug. Keywords: Argemone mexicana L., anti-urolithiasis, calcium oxalate, cystone, nucleation assay, aggregation assay. Affiliation:Department of Biotechnology, Karpagam University, Coimbatore-641021, Tamil Nadu, India. Keywords:Argemone mexicana L., anti-urolithiasis, calcium oxalate, cystone, nucleation assay, aggregation assay. Abstract:Background: The current study was performed to evaluate the anti-urolithiatic activity of Argemone mexicana L. leaves extracts as natural remedy to over come side effects problem due to the usage of modern synthetic medicine.